This month we would like to congratulate the Cloverdale 4-H Club for being awarded the Nebraska 4-H Club of the Month for November 2017. 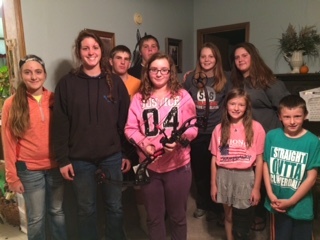 This club from Chambers, in Holt County, has truly made a difference in its community. The club is dedicated to building strong citizenship and teamwork through various activities. The Cloverdale 4-H Club is an active group of kids and adults. It has more 30 members ranging in age from 5 to 18. The club holds at least 7 meetings a year where the pledge is recited and parliamentary procedure is used to conduct the meetings. Every year the group does one or two club projects such as re-wiring a lamp, making a small bookshelf, making an extension cord, using a recycled tire, rocketry, canning, baking and a variety of craft projects. The members have learned life skills at the meetings as well. They have learned how honey is extracted, how to sew on a button, basic cooking, simple sewing, gardening, canning and once they even learned table etiquette. Members are great about helping get the fairgrounds ready every year. The club cleans and prepares the show barn and helps put out trash cans. They donate money to purchase trophies and auction items. They even donated $250 to three 4-H clubs in Kansas that were affected by the wild fires last year. The Cloverdale 4-H Club holds a meeting at the assisted living center once a year and then play Bingo with the residents. Many residents still remember the 4-H pledge from their 4-H days. The club holds various social gatherings throughout the year. The annual Christmas party and gift exchange is a fun way for whole families to celebrate together. During the fair, members hold a club lunch after the swine show since almost half of the club is involved with pigs. To celebrate the end of summer, members go tanking and have a bonfire. The Nebraska 4-H Foundation provides the 4-H Club of the Month program to all Nebraska 4-H clubs throughout the state. Clubs can nominate themselves by telling why their club should be chosen as Club of the Month. A different club will be chosen each month and will be awarded with a certificate and $50 cash card. For more information go to the Nebraska 4-H Foundation website at http://www.ne4hfoundation.org/recognition or e-mail ne4hclubofthemonth@gmail.com. No Comments to "November 2017 Club of the Month"